The United Nations Office for Outer Space Affairs (UNOOSA) and the Japan Aerospace Exploration Agency (JAXA) have selected a team from the Universidad del Valle de Guatemala for the second round of the UNOOSA-JAXA KiboCUBE program. 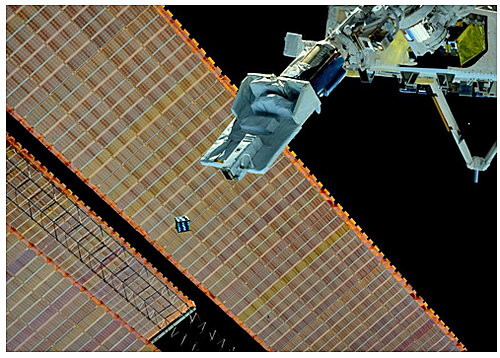 Deployment of a smallsast from the ISS. Photo is courtesy of NASA/JAXA. KiboCUBE is an initiative that offers educational and research institutions from developing countries the opportunity to deploy cube satellites (CubeSats) from the Kibo module of the International Space Station. As the successful candidate, the Universidad del Valle de Guatemala team plans to use its Guatemalan CubeSat to test equipment for monitoring the concentration of harmful cyanobacteria (algae blooms) over inland bodies of water. The KiboCUBE initiative was launched in 2015 as a capacity-building initiative by UNOOSA and JAXA. The first round saw a team from the University of Nairobi selected, and preparations are currently underway for the launch of their satellite. Applications for the second round of KiboCUBE selection closed on 31 March 2017 and UNOOSA and JAXA were pleased with the quality of the applications received. 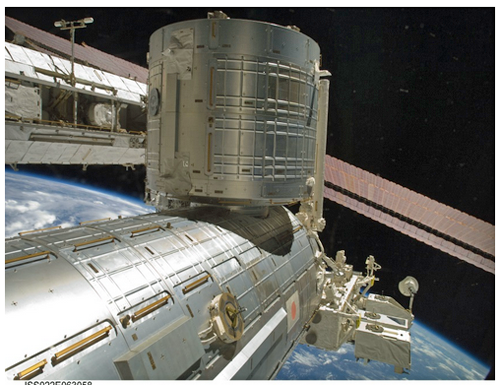 Kibo Module on the ISS. Photo is courtesy of NASA/JAXA. Luis Zea and Víctor Ayerdi, coordinators of the project at Universidad del Valle de Guatemala, stated that the mission of the project is to design, develop, and operate a cubesat to test a multispectral sensor prototype, opening the field of space science and technology in Guatemala. It will also help us develop the country's human capital and will enable the independent acquisition of remote sensing data for natural resource management and other peaceful purposes. UNOOSA Director Simonetta Di Pippo noted his organization is pleased to continue the KiboCUBE partnership with JAXA. This is an important initiative that helps foster national capacity in space technology engineering, design and construction, and supports a number of Sustainable Development Goals. JAXA International Space Station Program Manager Koichi Wakata added that the KiboCUBE program assists capacity-building in space technologies in non-space-faring countries, thanks to this partnership with UNOOSA. Using the unique capabilities of the Japanese Experiment Module "Kibo" on the International Space Station, 198 smallsats have been deployed from "Kibo" to date.